Lillian Hellman, American playwright, wrote a series of powerful, realistic plays that made her one of America's major dramatists. She explored highly controversial themes, with many of her plays reflecting her outspoken political and social views. 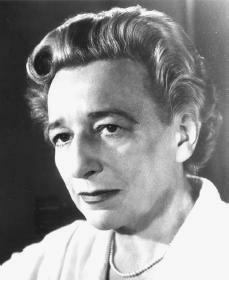 Lillian Florence Hellman was born in New Orleans, Louisiana, on June 20, 1906, of Jewish parents, Max Hellman, a shoe salesman, and Julia Newshouse, whose family had made a small fortune in the banking industry. In 1910 her family moved to New York City, where she attended public schools. Her schooling was constantly interrupted by her father's frequent business trips to New Orleans, which would sometimes last up to six months. Hellman went on to study at New York University (1923–1924) and Columbia University (1924). Her marriage to Arthur Kober in 1925, who was a writer for the New Yorker, helped Hellman get various jobs around New York City, including reading scripts for studios and working as a book reviewer for the New York Herald Tribune. The marriage ended in 1932. Hellman worked as a manuscript reader for Liveright Publishers before becoming main play reader for producer Herman Shumlin. In 1930, ready to drop her idea of being a writer, she was talked out of quitting by Dashiell Hammett, who became her lifelong mentor (teacher) and partner. After a "year and a half of stumbling stubbornness," Hellman finished "The Children's Hour" (1934), based on an actual incident in Scotland. The action of the play is triggered by a child's accusation of sexual relations against two female teachers, which leads to one woman's suicide (where a person takes his or her own life). The play reveals Hellman's sharp characterizations and clear, moral comment on a theme considered dramatically untouchable at the time. "In Days to Come" (1936), a play of a crumbling family as well as of the struggle between union (an organization that fights for workers' rights) and management, Hellman's dramatic touch faltered. However, her next play, "The Little Foxes" (1939), ranks as one of the most powerful in American drama. Set in the South, it depicts a family almost completely engulfed by greed and hate. During World War II (1939–45; a war in which France, Great Britain, the United States, and the Soviet Union fought against Germany, Italy, and Japan), Hellman wrote two plays. "Watch on the Rhine" (1941), which received the New York City Critics Circle Award, was a drama about an underground hero, and spoke out harshly against the Nazis (a radical political party that controlled Germany leading up to, and during, World War II). "The Searching Wind" (1944) championed the movement against fascism (a form of government characterized by leadership by one all-powerful ruler), criticizing the failure of influential Americans to halt the rise of Germany's Adolph Hitler (1889–1945) and Italy's Benito Mussolini (1883–1945). and revealing insight into a southern boardinghouse. The style of the play is sometimes compared to the Russian writer Anton Chekhov's (1860–1904) work. "Toys in the Attic" (1960), a devastating portrait of possessive love set in New Orleans, won her another New York Critics Circle Award. Hellman demonstrated her versatility as an author with a witty book for the musical "Candide" (1956); adaptations of two plays, "Montserrat" (1949) and Jean Anouilh's "The Lark" (1956); and her departure from realism (realistic pieces) in the humorous play of Jewish family life, "My Mother, My Father and Me" (1963). She also edited The Letters of Anton Chekhov in 1955. Hellman published three memoirs (personal writings) dealing with her career, personal relationships, and political activities: An Unfinished Woman (1969), Pentimento: A Book of Portraits (1973), and Scoundrel Time (1976). These works included her sharp criticism of the House Unamerican Activities Committee headed by Senator Joseph McCarthy (1908–1957), which accused hundreds of politicians, artists, and other Americans of being communists, the political design where goods and services are owned and distributed by the government. There was much discussion at the time about whether the content of these memoirs was greatly enhanced by Hellman. Hellman received honorary degrees from several colleges and universities. Her theatrical awards included the New York Drama Critics Circle Award (1941 and 1960); a Gold Medal from the Academy of Arts and Letters for Distinguished Achievement in the Theatre (1964); and election to the Theatre Hall of Fame (1973). She also received the National Book Award in 1969 for An Unfinished Woman and a nomination in 1974 for Pentimento: A Book of Portraits. Hellman died June 30, 1984, in Vineyard Haven, Massachusetts. Hellman, Lillian. An Unfinished Woman: A Memoir. Boston: Little, Brown, 1969. Hellman, Lillian. Pentimento: A Book of Portraits. Boston: Little, Brown, 1973. Hellman, Lillian. Scoundrel Time. Boston: Little, Brown, 1976. Rollyson, Carl. Lillian Hellman: Her Legend and Her Legacy. New York: St. Martin's Press, 1988. I have learned many things about the life of Lillian Hellman through someone who has lived one of the stories she has written in "Pentimento", as well as the File, "Julia". It was intentionally written by Ms. Hellman, in her honorable roll of trying to find a baby, hidden from the Nazi regime. I have a private photograph of Ms. Hellman, at a large family reunion of friends whom she was well acquainted with and wrote about, at the beach in Germany 1937. The woman she writes about did attend private school in New York, and was a daughter of the Astor family. She attended Oxford in England at age 19, and went on to the Medical University at Vienna where she studied under Freud. This is a true story. The people in this photograph are real historical figures of the time, many with descendants living today.